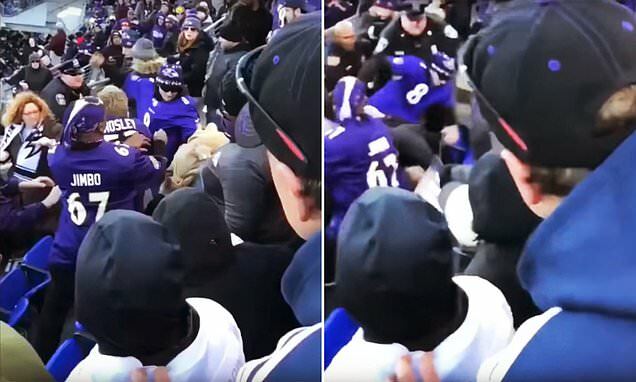 During a close contest at Baltimore's M&T Bank Stadium, some Baltimore Ravens fans were caught on video fighting Los Angeles Chargers fans. At the beginning of the video, a man wearing a No. 8 Lamar Jackson jersey can be seen wildly punching and kicking at another man in Chargers' gear on Sunday, according to CBS Baltimore. That man seemed to be wrestling with another man in a beige jacket when police arrive to pull the punching fan out of the fray. Suddenly, the two men still struggling with each other go pitching over the seats falling a few rows down from their original position as some fans scream in shock.